les anti-modernes*: lust and found: the lady bag. lust and found: the lady bag. super excited for this to arrive next week. i'm not a fan of the brand today, but i love vintage Coach as epitomized by the minimalist hardware and clean, classic lines. i don't own any very structured bags or have anything in this color in my small bag collection. and i won't lie; watching 4 seasons of Mad Men has colored my vintage radar just a bit...this would be the perfect bag for a night out or days when i'm running around with just the bare essentials. check out more vintage gems in Jo's lovely and well-curated shop. I don't know anything about Coach's limited edition bags but this is SO beautiful. Oooooooh. I love the classic Kelly shape. Don't know anything about the Made in Italy era either but I love the Bonneie Cashin era of Coach and even until say, 5-7 years ago, I would consider buying a nice satchel or hobo from Coach. Now, Coach bags are horrible quality, relatively expensive, and they look like they share a designer with Guess. Tragedy for the legacy. wow, that's gorgeous. and very much like a kelly. 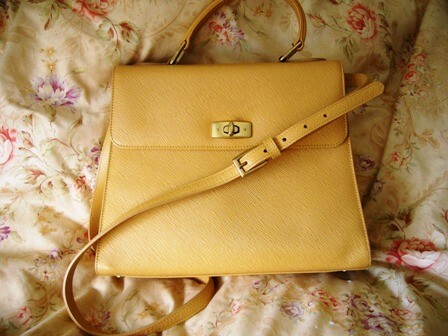 :) I love vintage Coach bags and totally agree that they are so much nicer than their recent designs. Man, I love vintage coach. My mom's first designer bag was a Coach bag she got in the 90s and she gave it to me when I was 21. You've got yourself a fine fine bag, ma'am. I find that more often that not I enjoy the vintage more than the current from brands that are bigger now, such as Coach. An old boss of mine had a vintage coach backpack and I was always slobbering over it! kristin & ammu - thanks! :) i did a double-take when i saw it on etsy. jenny: i love that your mom gave you her first coach bag! do you still have it/use it? you should do a post on it. these pieces are always so much more special when they've got great stories behind them. hetterson: this seems to be the case more often than not nowadays. there is some nostalgia at work when it comes to vintage, but overall i feel like it's quite a challenge to find designers and brands that maintain an integrity of craftsmanship. and of course only a tiny % can afford the ridiculously high prices for, say, Hermes. i have a similar one, but smaller and in black! i modified the leather strap to a cross-body chain because i thought it was initially too short. the leather is really gorgeous in real life... it's a shame coach doesn't produce more bags like these. oh well, i guess we're the lucky ones! dahlia: oooh that's really ingenious what you did with your coach bag! :D so glad to hear that the leather is really good. 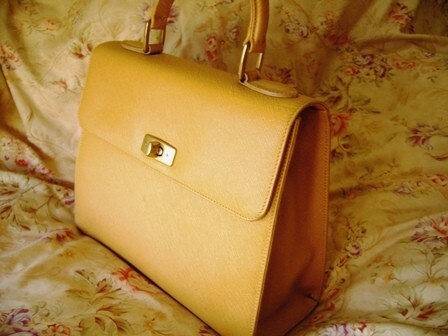 this 'kelly' bag from the 90s is apparently quite rare - we are lucky! Wow, this is really pretty. Everyone seems to be making great vintage Coach finds in thrift shops - I'm definitely missing out, but that's what Etsy is for. Looking forward to seeing this guy in action on your blog. V - etsy has a great selection of vintage, and i think the prices are a lot more fair than on ebay which tends to be a snipefest...i love that it's still quite possible to get some rare and lovely vintage Coach pieces from the 60s/70s/80s and 'new' vintage ones from the early 90s. i love this bag so much i am now stalking ebay for one,possibly my first coach purchase. love your fashion style and your blog! I Purchased it in 2003/2004, I love It, it still Looks New.